« « Navigate Toward The Past: Press button… Receive bacon! This is a long weekend for the kids – they have both Friday and Monday off for Columbus day. It’s an ESPECIALLY long weekend because Eileen is traveling for work this weekend as well! She’s going down to Hershey, PA to visit the plant that makes Reese’s Peanut Butter Cups (or something like that). I asked her to bring me some “fresh” off the line, but we’ll see about that. So, because I’m all alone with the three kids for five days, I’m having trouble getting my rear in gear – so I’ve been procrastinating a bit and was doing some useless searches on Google while my breakfast digests (I made French Toast this morning – YUM). Here’s what I came up with: PLANET M&M’S. Ya know, I’m not sure what’s worse, the stuff that I do with way too much time on my hands OR the stuff that companies do that have, apparently, WAY TOO MUCH MONEY on their hands. 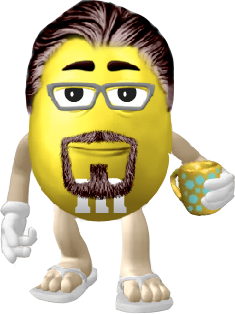 There are a few problems with it, mainly that I really can’t grow a goatee and my hair is much more curly, but hey, IT”S A FRICKIN’ M&M… It’s name (because you have to name them) is Don Bubba The Oblong… don’t ask. Well, I’ve completely wasted a good part of an hour now – I think I’ll go play Wii with the kids! You have waaaayyyy too much time on your hands my friend!!!! That’s a riot. Your M&M looks like Bob.